Need a New Washing Machine? The Trump Tax Is Gonna Cost You. After the Trump administration announced new tariffs on imported washing machines in January, Marc Bitzer, the chief executive of Whirlpool Corp., celebrated his win over South Korean competitors LG Electronics Inc. and Samsung Electronics Co. “This is, without any doubt, a positive catalyst for Whirlpool,” he said on an investor conference call. Nearly six months later, the company’s share price is down 15%. One factor is a separate set of tariffs on steel and aluminum, imposed by the U.S. in March and later expanded, that helped drive up Whirlpool’s raw-materials costs. Net income, even with the added benefit of a lower tax bill, was down $64 million in the first quarter compared with a year earlier. Bill Anders, 61 years old, a retired educator in Churubusco, Ind., decided in April to use his tax refund money to replace some appliances. The price for the washer and dryer combo he preferred, manufactured by LG and sold by Sears, was about $2,478 including installation. It was so much he decided to forgo buying other appliances. “We looked at stoves and dishwashers, too, but with the money we had in hand, so to speak, we just decided to do the washer and dryer,” he said. Ryan Smith, of Smith’s Appliances outside of Kansas City, an appliance repair business, said higher prices have helped his business of keeping old machines churning. In the past, when washing machine repairs cost more than $200 people skipped repairs and bought new machines. “Now we are doing more expensive repairs such as tub bearings, gear cases and control boards, pushing $300 to $500,” he said. 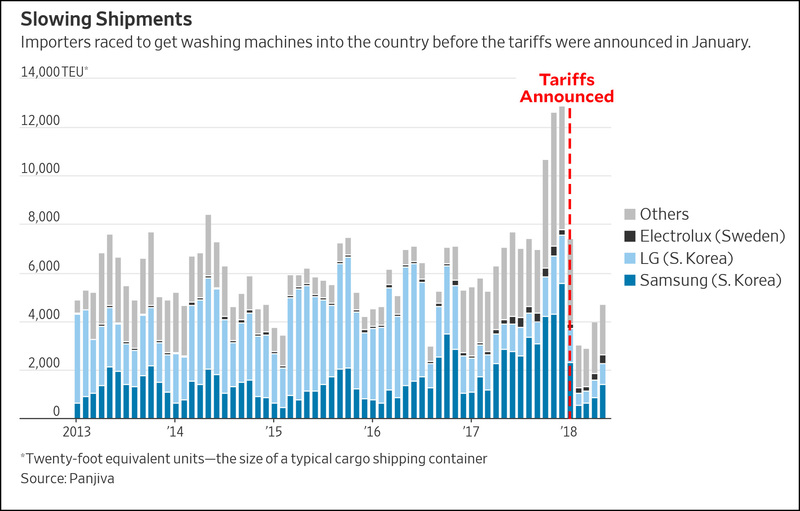 Washer shipments, a proxy for sales, to U.S. dealers dropped 18% in May compared with the previous year, the steepest monthly decline since March 2012, according to data compiled by the Association of Home Appliance Manufacturers, a trade group. Basically, the whole industry is now in the doldrums and everyone is losing money. It’s yet another victory for targeted trade tariffs.